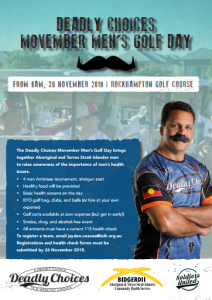 The Deadly Choices Movember Men’s Golf Day brings together Aboriginal and Torres Strait Islander men to raise awareness of the importance of men’s health issues. To register a team, download the Flyer. submitted by 26 November 2018.